This is a popular beach of north Goa. It gets very busy in Anjuna from November onwards with tourists of varied types flocking to this otherwise simple village. The atmosphere here during the peak season surprises as it a favorite destination of the hippies and backpackers since the 70's. Anjuna gets inundated especially on Wednesdays with folks of backpackers, round-the-world travelers, etc. 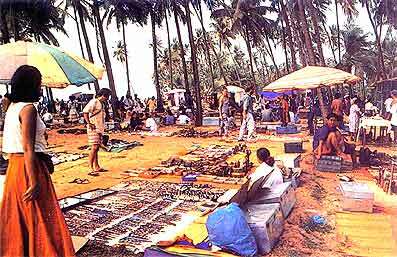 for the famous flea market that has become a must visit event for anyone traveling to Goa. The merchandise mainly consists of jewellary, clothes, appliqué work, papier-mâché boxes, turquoise bracelets, you name it and you find it there. Accommodation in Anjuna is not as furnished as one would find at other beach destinations of Goa. but nevertheless finding a place during peak seasons can be really difficult. There are guest-houses and small average hotels who would rather welcome someone willing to stay for a couple of months. Same with the restaurants, although there are plenty of them along the way.